You know what it is like: Sometimes visitors browse your shop, maybe even place products in the shopping basket, and then suddenly they begin to wonder whether they should look somewhere else instead. Use this moment of uncertainty to your advantage and make your visitors an attractive offer right there and then in order to reduce the number of abandoned purchases. The exit-intent popup, which opens shortly before the visitor leaves the online shop, enables you to offer, for instance, a discount on the current purchase price or waive the delivery charges if the customer subscribes to the newsletter. What is the exit-intent popup? More than 68% of all online buyers leave the shop without having completed the purchase. This is precisely where the exit-intent popup comes into play, with the aim of taking your visitors to the check-out. The exit-intent popup is a window that opens as soon as a visitor would like to leave your shop. This popup is triggered when the mouse pointer is moved onto the browser navigation bar – with the intention of closing the browser window or tab featuring your shop – without having purchased anything. More sales: You can reduce your abandoned purchase rate and thus directly boost your sales thanks to the exit-intent popup. The exit-intent popup can be configured and activated with just a few clicks in the myTS member area – in line with your preferences and with the content that you want. 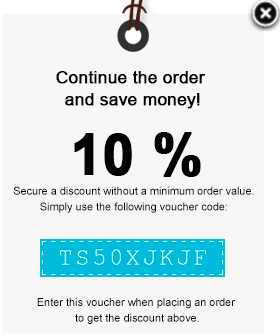 The simple version: You use the vouchers that you generate with Trusted Shops. Incidentally, with a success rate of over 64%, discounts and vouchers are the most successful reactivation measures that online shops use. You fill the popup with a custom HTML code and determine its look and content. 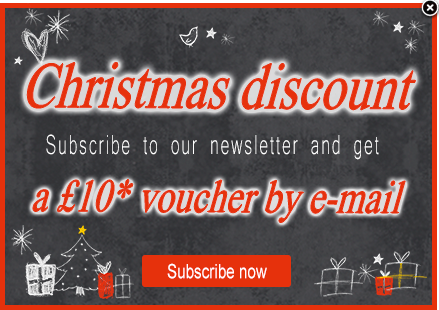 This enables you to link the discount to a newsletter subscription, as shown in our example. Do you have any questions, suggestions or problems regarding the integration of the popup? Please contact us at productfeedback@trustedshops.com.